just as i was about to consign to old age the fact that i am not getting any better at running, along came the condura skyway marathon yesterday, where against all odds, i established a personal best time of 2:21:47 in the 21K distance, which is more than 42 minutes better than my last half marathon, and about 14 minutes better than my previous record. 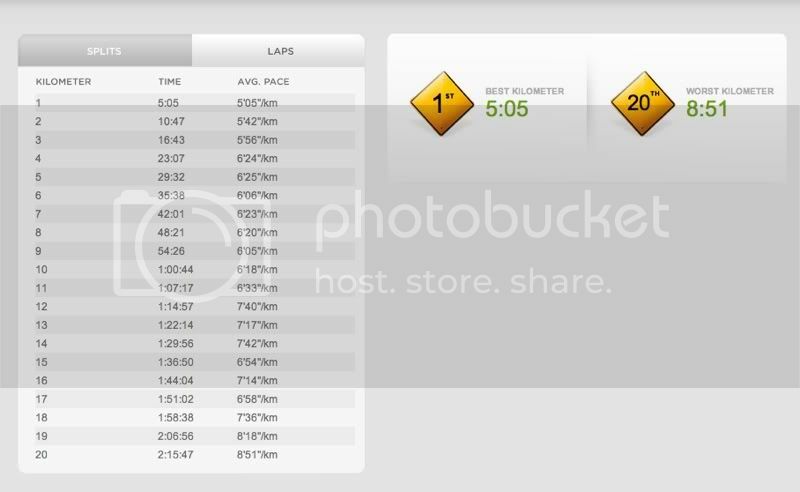 on average, i improved my half marathon time by 26'10". and i am extremely happy. 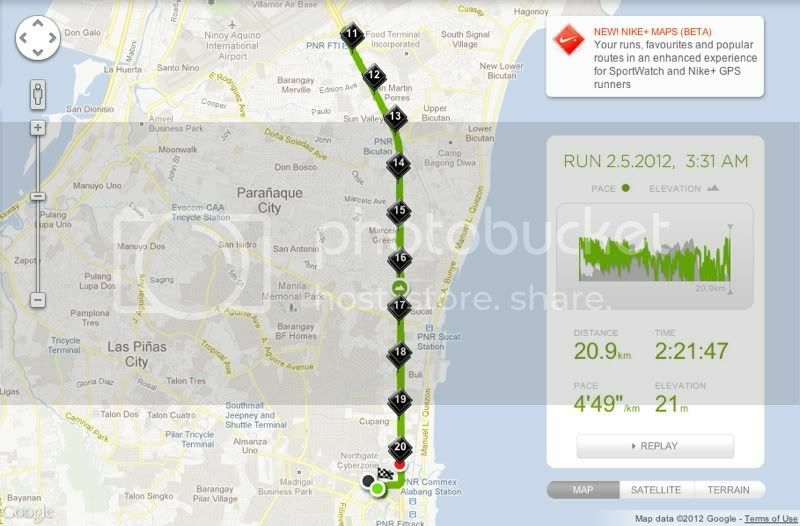 weeks before the date of the marathon, i did not make any predictions about how well i would do in my 21K. anyone who has bothered to check this blog would have noticed how often i have failed in meeting my expectations: i always fall short, owing to some factors, not all of which are outside my control. with the exception of pain, or even gas, i am always just really lazy, asking myself why i submit to the attendant pains of middle distances, when i very well could join the throng in finishing easy 10Ks. but when i finally push against the pavement on the last half kilometer, i always realize that if i hadn't been overcome by sloth, i would have met my goal, exceeded my expectations. and these pains -- these lovely, heavenly pains -- i crave them, cherish them. they remind me of my frailties as a human being, and how pushing beyond my limitations makes the struggle worthwhile. 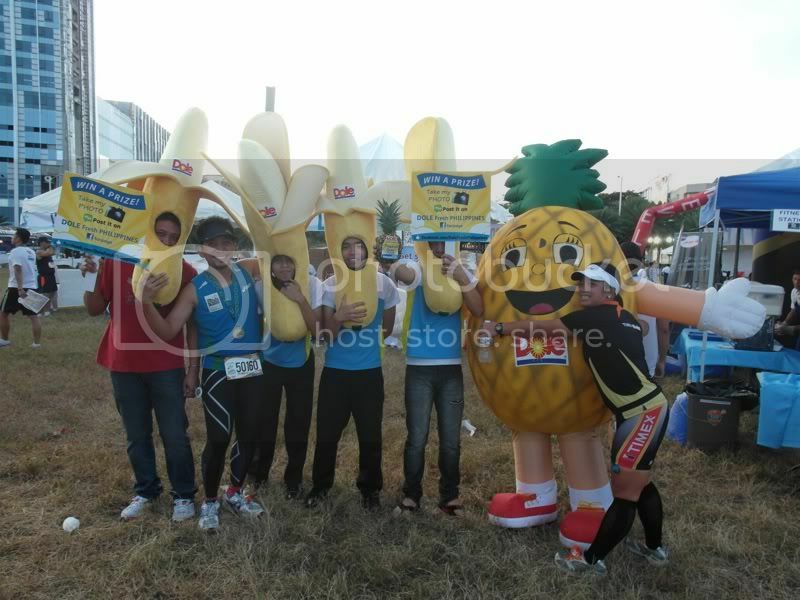 i wouldn't say i was more prepared now than i was for my standard chartered marathon singapore. i clocked longer hours running for the entire month of november, almost 8 kilometers more than my investment in january, when i even went for a week without a run. 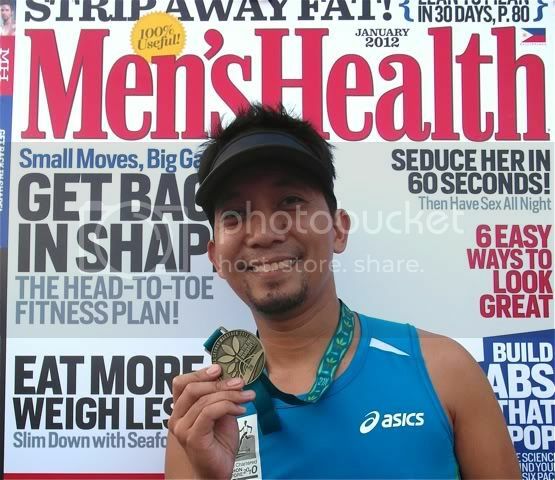 the difference is that i dared to run longer distances: my legs chased two 10-milers and a 15K, my marquee race categories. but more than just muscle memory, i think what resulted in a much better showing this time was my mental state: there was no gnawing discontent about the choice of physical exertion over having a great time in the city (although i did leave a high school homecoming earlier than usual in order to be at the starting line on time). i was just interested in exorcising the ghost of my half marathon time. and what a spectacle i made out of it. which is not to say that i was wholly committed to this exercise: i downloaded a 6-week half-marathon training program which i pretended not to understand so that i wouldn't be faulted for not following the routine it prescribed. in fact, when i was at the 16K point, i was asking myself: why didn't i just run this distance instead? i had to shove these negative thoughts aside even as they clamped my already heavy legs with balls of lead. 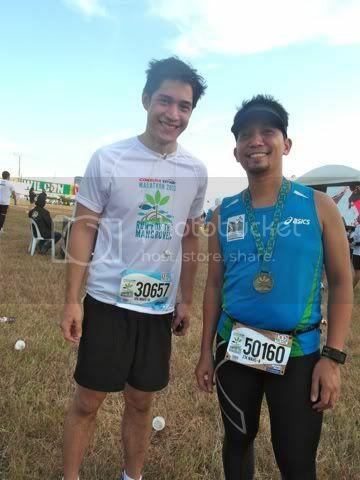 after 15 kilometers, despite the visual image the remaining 6K imbued in me, i was already dragging my feet. in the horizon, fireworks illuminated the sky over the condura village in filinvest alabang: it seemed so far away, and i was already walking intermittently: a pair of lampposts every time, at most 3.
it didn't start that way, actually: i did quite well in the first 5 kilometers, when a pair of runners paced me, until one decided i was too slow, while the other sank back. i was doing too well perhaps that i worried i might get too tired too early, so i decided to slow down. close to the turnaround approaching C-5, i noticed that the runners going back to alabang still didn't count in the hundreds. i was elated. being an early registrant, i was part of wave A with a handful of elite runners, sent off at least 14 minutes ahead of wave G, but i hit a wall immediately after i encountered the approaching crowd, and i allowed too many runners from later waves to overtake me. i would have been happy to just slightly improve from my best time so far. in fact, when i was asked what time i expected to finish, i very humbly said i wanted to do a sub-2:30. which meant i would have been happy to finish in 2:29. but when i crossed the last toll booth i realized that i could finish this in 2:25! so although my mind battled with my legs and the rest of my body, i finished the best way i could, despite the short uphill push going towards the finish arc. so i'm very happy with the condura skyway marathon this year. initially, i had misgivings about it starting all the way in alabang. i am not a southie, and i have probably been to the filinvest festival mall only twice. perhaps i am too used to having races start in nearby bonifacio global city or in makati, and the commute to alabang feels too much of an effort. so it was a good thing i managed to hitch a ride with janice. the race started at the tunnel where the skyway terminates, and we went up against the normal flow of traffic. at that time a few runners from the full marathon were already finishing, but they were few and far between. not until the 6 kilometer mark did they number in bunches. i imagined these guys would finish in 4:40, which is an amazing time for most runners of any age, regardless of experience. water stations were spaced about 1.6km apart, although i did skip some of them as i was neither thirsty nor hot. our race began at 3:30AM, and this time of the month is usually the coldest in so far as tropical manila weather is concerned, and a nice breeze accompanied us until i finished ahead of the sunrise. analyzing the race map, i worried about congestion approaching the finish line, considering that the ramp leading to alabang was just a little wider than 1 lane, but the bulk of runners in the 10K began their race 2 hours after ours, so i was well on my way to snatching a PR by the time they were crowding the skyway. so i am happy with how this race was organized. i did notice a few kinks that could have been improved, which didn't matter to me so much because i was already going back while the stream of runners was still thin. last year, i remarked that having water stations on both sides of the road was genius, particularly when the same space is filled with runners coming and going. but for at least two water stations, i bumped into oncoming traffic. this was quickly remedied, though when they moved some tables to the other side so that anyone's natural cadence wasn't disturbed. other than that, my main complaint really would have been the band that played at the condura village. they were just plain awful, about as good as the band that played in the ati-atihan festival in kalibo. the village itself was a bit too big, it made the pack of 13,000 runners appear scattered. but all things considered, the condura skyway run truly is the premier running event in the philippines. i agree with how it bills itself now because it has truly improved from just a few years of missteps. it was well-organized, smoothly-planned, and almost flawlessly-executed. it owned up to its environmental angle by reducing the impact of the race on nature, exerting efforts to make it more green. it certainly is the safest run in the country, where the only things on wheels that share the run course with you are ambulances, motorcycle escorts for the leaders, and cyclists assisting runners (can i just insert that ateneo SPEED's no speed limit race is the most dangerous run i've ever participated in?). the only thing i might disagree with is the condura run's goal of inching close to the standard chartered marathon singapore's attendance of 12,000 entrants in the full marathon. i personally feel that while enticing more filipinos to take up running in pursuit of a healthy lifestyle is something to be admired, having that many runners in just one skyway might be a nightmare. this is already the best run i have seen -- certainly the most expensive, but hey, when does anyone ever get to step on the skyway? -- even when it wasn't this good, so why set goals to make it less of an ideal race? if at all, what the race should aspire for is drawing more international elite athletes: journeying runners who do a tour of the world's top marathons, as well as more foreign entrants who travel to destinations in order to run unique courses. the philippine-based kenyans are giving the best filipino runners a very good challenge, but they aren't even in the radar in so far as the rest of the world of running is concerned. their otherwise amazing times may even be below club standards. so i walked away from the condura village under some pain, limping only very slightly, and happy with a time that i would have only imagined two years previous. around me, runners beaming proudly with their accomplishments milled around, refusing to remove what one full marathon runner described as an unnecessarily large medal from their necks, which ultimately made them look like they were wearing saucers on their chests, enjoying the frou-frou that, while probably unnecessary in a race, make it more attractive: photo booths, free ice cream, free beer, free milk, celebrities. 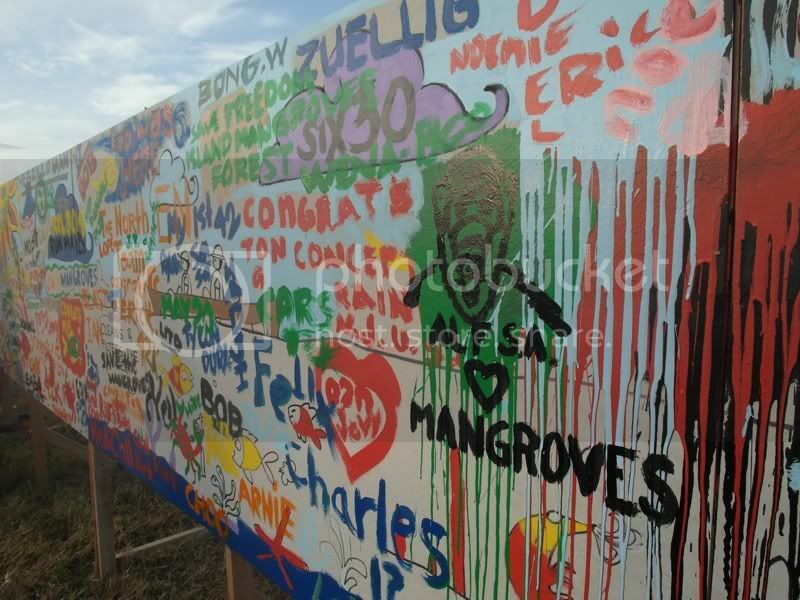 there was even a mural of mangroves (obviously it was a poor attempt to copy the dolphin mural from last year) which was vandalized by runners, about which the artist complained that this lack of concern is precisely why we need to raise awareness in order to save our dwindling mangrove forests, for which the race raised over half a million pesos. so we've done it for tubattaha, for the whale sharks, for the dolphins, and for mangroves. i wonder how next year's race advocacy would sound like? will it be for the philippine eagle? the manatees? the flying fox? the spotted deer?